If you happen to be in the area of Atlantic/Neptune Beach the 3rd Thursday of the month, make it a point to stop by the North Beaches Art Walk. The National Save The Sea Turtle Foundation has joined the many local artists with hopes of bringing awareness to sea turtles. We also are there to reach out and meet people of local turtle organizations to educate and join together to help protect this species. A typical art walk night, the local community and visitors pack the streets of Atlantic/Neptune Beach Town Center area to enjoy this fun and funky area of the beaches. It’s intoxicating to the eyes on the night of the art walk. Local artists pack the sidewalks with every variety of medium and talents, as well as live music, local cuisine, coffee shops, and mom and pop style shops tucked away, enjoyed by all. With inclement weather for what seemed like months consistently on art walk night, it nearly ‘rained on our parade.’ But, in January, our luck changed. Finally clear starry skies emerged and people came out of the woodwork to enjoy the North Beaches Art Walk once again. 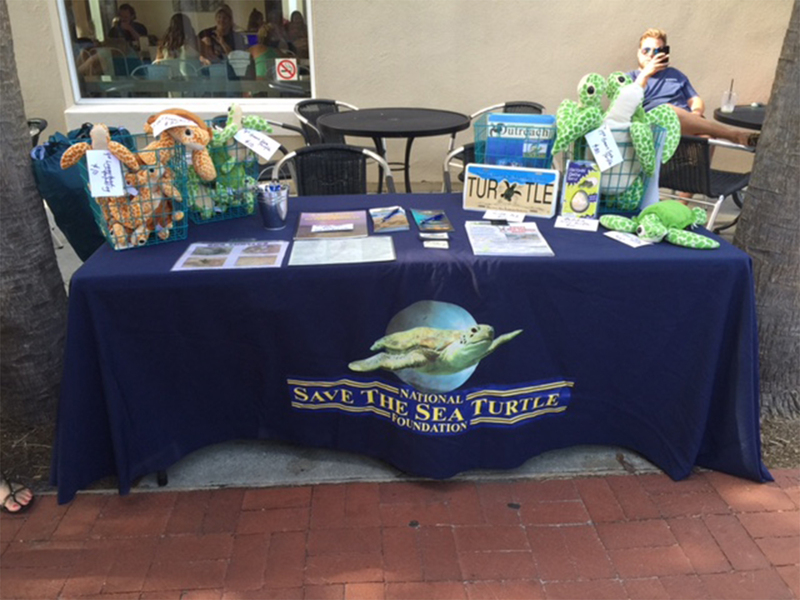 At the National Save The Sea Turtle Foundation table set up, we were busy meeting people and introducing ourselves again to the area. We also held a coloring contest in spirit of the art walk for our littlest art walk goers. While our volunteers “turtle talked” to parents and passerbys, our color contestants were hard at work coloring for the grand prize gift basket filled with Foundation goodies. The contestant winner of the night was awarded to Thorpe Price. With his colorful interpretation of the green sea turtle, we loved his detail and passion spilling into his picture. While there was only one grand prize winner, we didn’t let any of our contestants go home empty handed. Everyone at the National Save The Sea Turtle Foundation is a winner. Our contestants were Daisy, Luke, Bobbie and Piper Ross, Thorpe Price, as well as Olivia and Isabelle Brunson. So, if you’re in town when the art walk is buzzing on that 3rd Thursday of the month, stop by the National Save The Sea Turtle Foundation table and say hello. If you’re local to the area or just visiting, get involved by becoming a member of the Foundation or adopt a nest. We are always looking for people to connect with and get involved to spread awareness to protect the turtle species and ecosystems. We are a non-profit and all proceeds are invested back into education, protection, and awareness. An ancient Indian proverb once spoken says…. Special thanks to: Joanne Harrigan, Jill Ross, Jennifer Baker and Colleen Meeker for your efforts in helping our organization locally by volunteering and giving us an outlet to reach the surrounding beaches community.